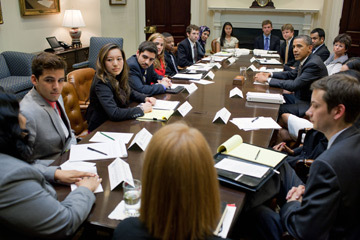 Sarah Tarrant of the Ohio State University's College of Social Work meets with President Obama and his Senior Staff along with other young leaders at the White House. A group of three graduate students in the College of Social Work at The Ohio State University were selected to attend a meeting with President Obama and his Senior Staff at the White House on June 6. The students were invited to the meeting as part of the President’s Young Americans Initiative due to their role in organizing “The Student Café: Conversations for Change” held in Columbus on May 24. Their event was selected as one of ten from 350 youth roundtables across the United States to talk to White House staff about the Student Café event and the importance of social services and the profession of social work. The concerns of the group were shared with President Obama and his staff at the meeting. The event and trip to Washington, DC, was sponsored by The Ohio State College of Social Work and the National Association of Social Workers Ohio Chapter Emerging Leaders program. The Student Café event brought together students and lawmakers to have roundtable conversations about budget-related issues within health and human services.